Our host, Aivar, at the Tian Shan observatory. Kyrgyz by birth, Aivar spoke good English, smiled often and took care of us for our night in the mountains. He even ensured that we got "Bush legs" for dinner. Read more about our adventures in the Tian Shan Mountains. Tian Shan observatory above Big Almaty Lake. Read more about our adventures in the Tian Shan Mountains. 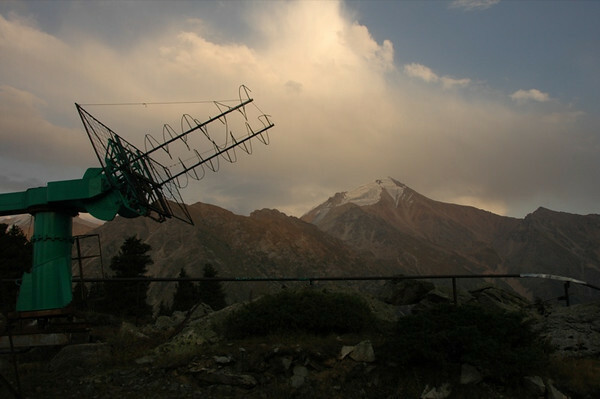 Our welcome to Tian Shan Observatory above Big Almaty Lake. The eerie silence and abandoned feel of the place made us wonder whether we had arrived at the Kazakh version of Bates Motel. This Soviet-era observatory partially survives financially on stranded hikers like us using their facilities for accommodation. 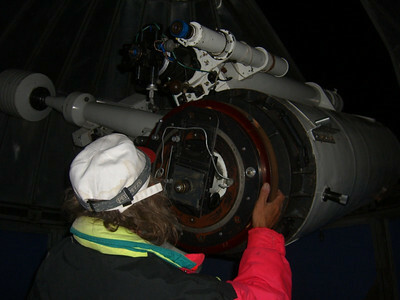 For a few extra tenge (about $4), an astronomer will pull out the big telescope and show you the stars. 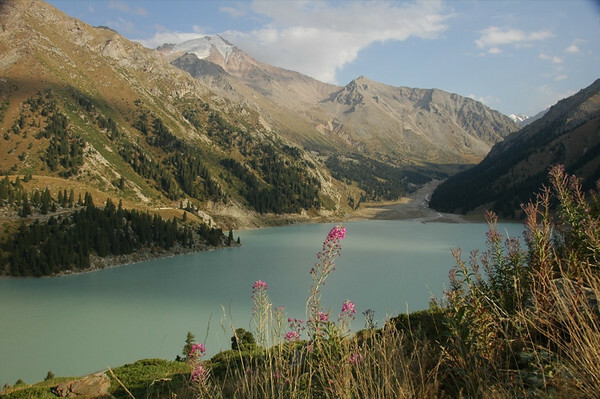 Recommended for a side trip from Almaty. 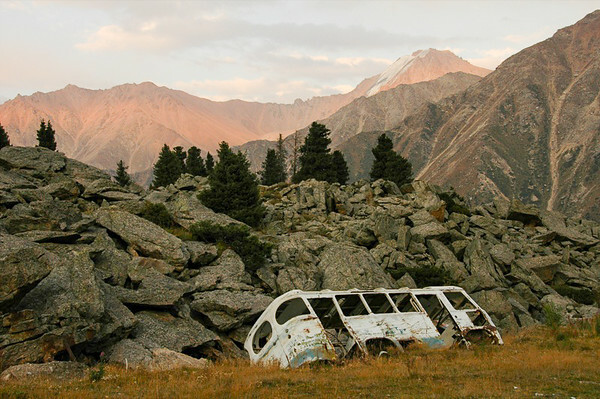 Read more about our adventures in the Tian Shan Mountains. 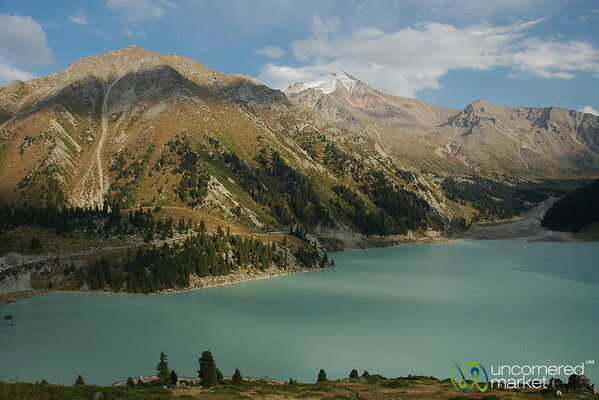 No, the water is not photo-shopped...this is what Big Almaty Lake actually looks like. 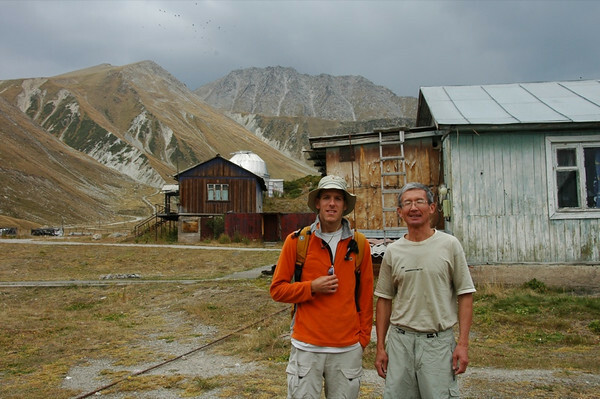 Read more about our adventures in the Tian Shan Mountains. 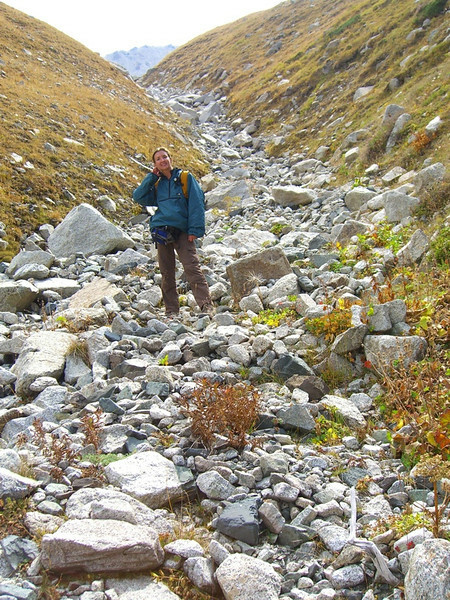 Dan stands at what we think is a path near the Zhusalykezen Pass near Kosmostansia in Kazakhstan's Tian Shan mountains. We were wrong. The path led us downhill, but almost to our disappearance. No one mentioned waterfalls, cliffs, and the rappelling we'd be required to do... Read more about our adventures in the Tian Shan Mountains. 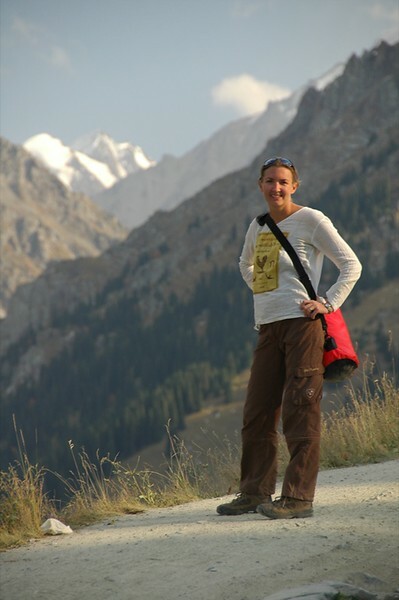 Audrey is ready to take on the Tian Shan mountains. Actually, she's pretty tired at this point from walking up-hill for 6 hours. 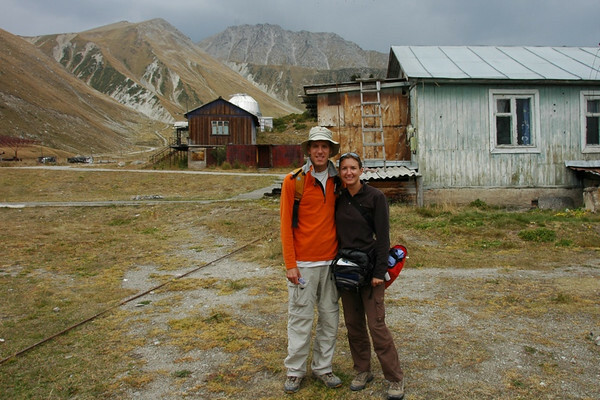 Read more about our adventures in the Tian Shan Mountains. 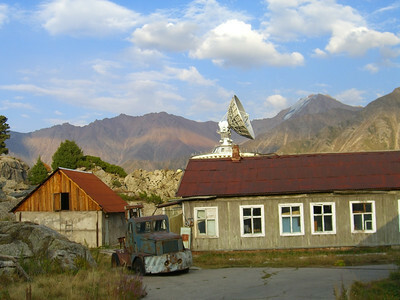 A receiver, or perhaps a missile tracking device on the grounds of the Tian Shan observatory in Kazakhstan. 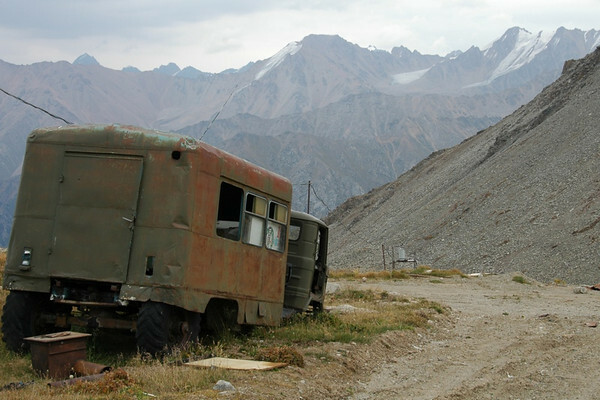 Read more about our adventures in the Tian Shan Mountains. Although not much of a picture, this shows the final feat on our descent from Big Almaty Peak to the city of Almaty. 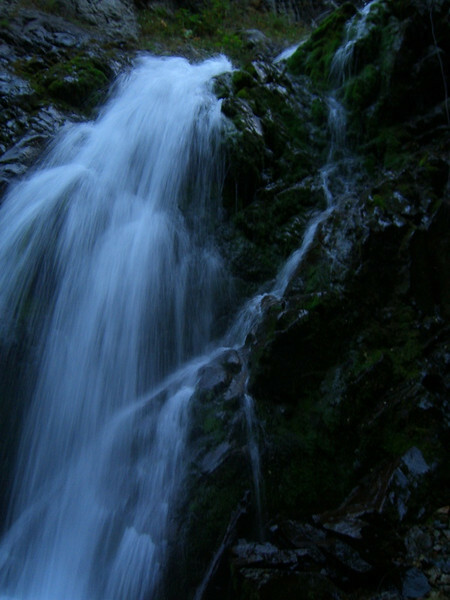 Luckily, someone had left a rubber rope tied to the top of the waterfall so we could repel down. Otherwise, we might still be there today waiting for a helicopter rescue. It took almost a week for our legs to recover Read more about our adventures in the Tian Shan Mountains. 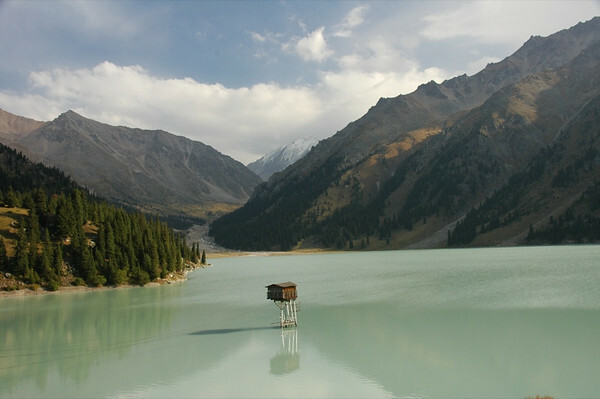 A tiny little shack stands in the middle of Big Almaty Lake in Kazakhstan's Tian Shan mountains. Read more about our adventures in the Tian Shan Mountains. 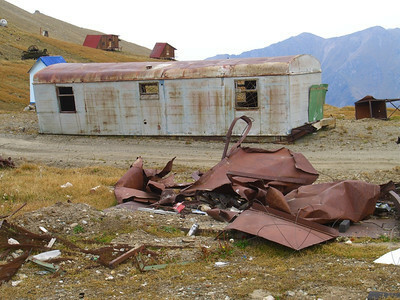 This truck apparently gave up outside Kosmostansia in the Tian Shan mountains in Kazakhstan. 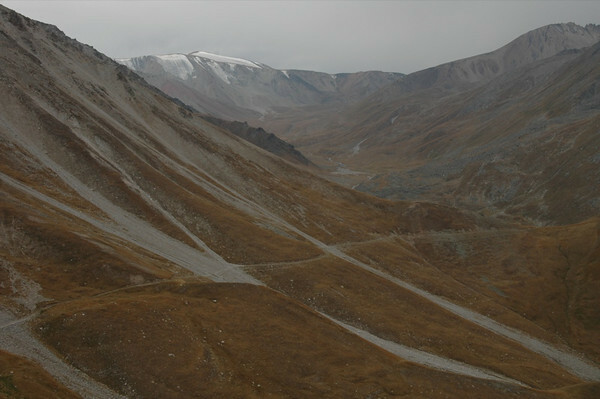 Read more about our adventures in the Tian Shan Mountains. 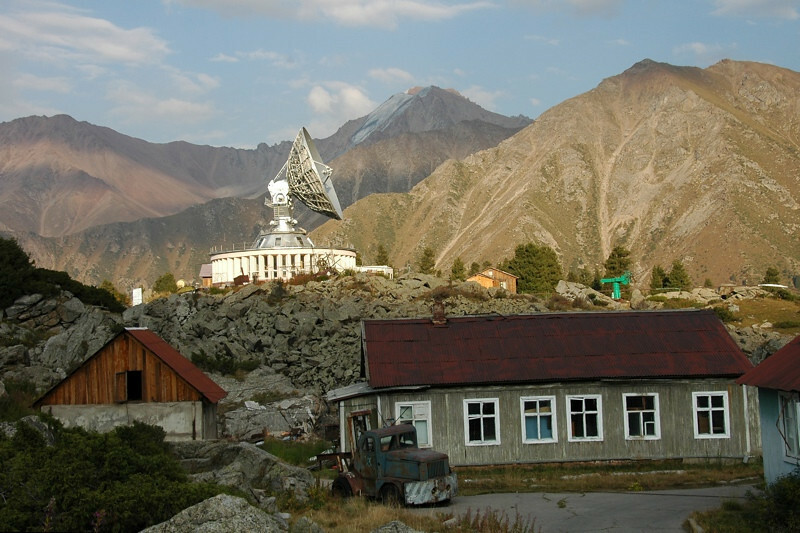 A Soviet-era observatory in the Tian Shan mountains struggles to get by. We're not quite sure what that huge satellite really does...The observatory grounds (just above Big Almaty Lake) is a worth a visit. Read more about our adventures in the Tian Shan Mountains. We found this hiker's (right) attire to be a bit curious...especially as the clouds rolled in and pelted us with icy droplets. 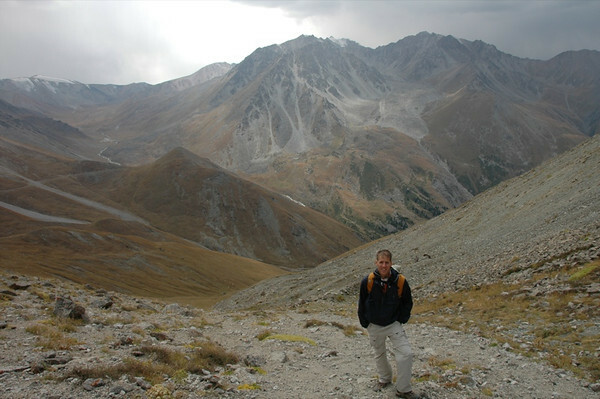 On the way from Tian Shan observatory to Kosmostansia in Kazakhstan's Tian Shan mountains. Read more about our adventures in the Tian Shan Mountains. 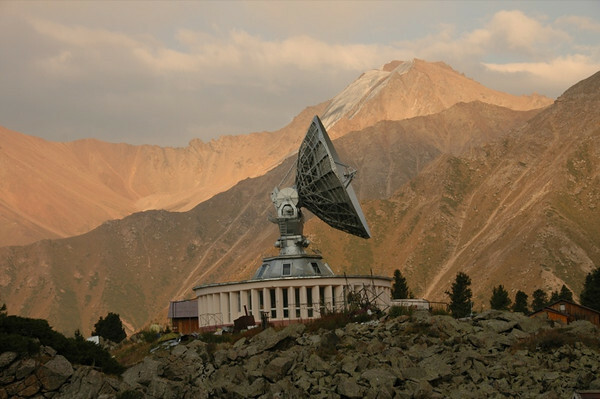 The visiting "astronome" at Tian Shan observatory gives us a tour of the sky from one of the observation centers. After he manually opened the skylights and fired up the 2500x telescope, we glimpsed an exploding star and a few star clusters. Then the smog and ambient light from Almaty kicked in. Read more about our adventures in the Tian Shan Mountains. Tian Shan mountains outside Almaty, Kazakhstan Read more about our adventures in the Tian Shan Mountains. The Tian Shan mountains surrounding Almaty. This particular view is on the way to Big Almaty Lake. 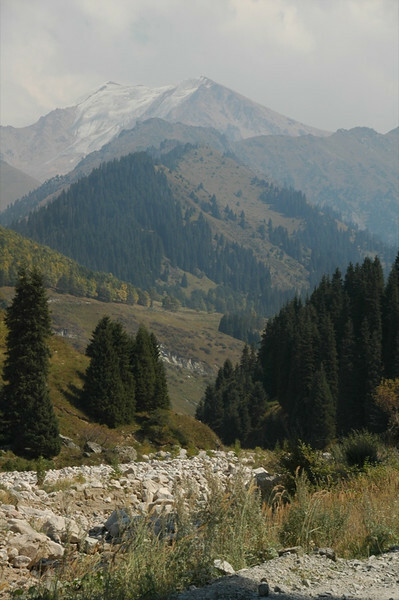 Read more about our adventures in the Tian Shan Mountains.